While this prototype could be mistaken for a BMW 7 Series mule, it is in fact the all-new 2010 Jaguar XJ. Spied in Germany, engineers have finally ditched fake body-panels in favour for thin psychedelic disguise. Design boss, Ian Callum recently said they spend ages creating camo on CAD in the studio to make sure it a: effectively hides the car and b: doesn't affect airflow and cooling of items on test. Before the new sedan's official launch in Autumn, we will see the XJ on 9th July 2009 at a special unveiling in London, followed by a show debut at the forthcoming Frankfurt motor show. 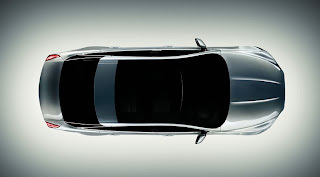 With aluminum construction, the X351 (XJ) will be the lightest luxury sedan in its class. Mate the aluminum construction and the pop-up JaguarDrive gear selector together with the latest 3.0D and 5.0 litre V8 engines and you'll have a powerful sedan with good fuel economy and low CO2 emissions, with the diesel set to emit less than 192g/km. A new option on the options list will be a panoramic glass sunroof. UK deliveries start early 2010.